If you’re anything like me, summer is a test of how many different ways you can write the word “salad” on endless potluck sign up sheets. Everyone knows that salads are some of the simplest, fool-proof potluck contributions–but none of us want to be “that person” who always shows up with the same green salad and overused set of tongs (nothing against green salads, they’re delicious–but you catch my drift..). So, what do we do? We start to populate those sign up sheets with an assortment of words that seem to sit quite comfortably in front of our good friend, “salad”–fruit salad, seven layer salad, chicken salad, tuna salad, bean salad, egg salad, pasta salad, etc. etc. I’m here today to perpetuate the trend. Why? Because, aside from PB&J, salads are the best thing to happen to this world (in my humble opinion, at least). 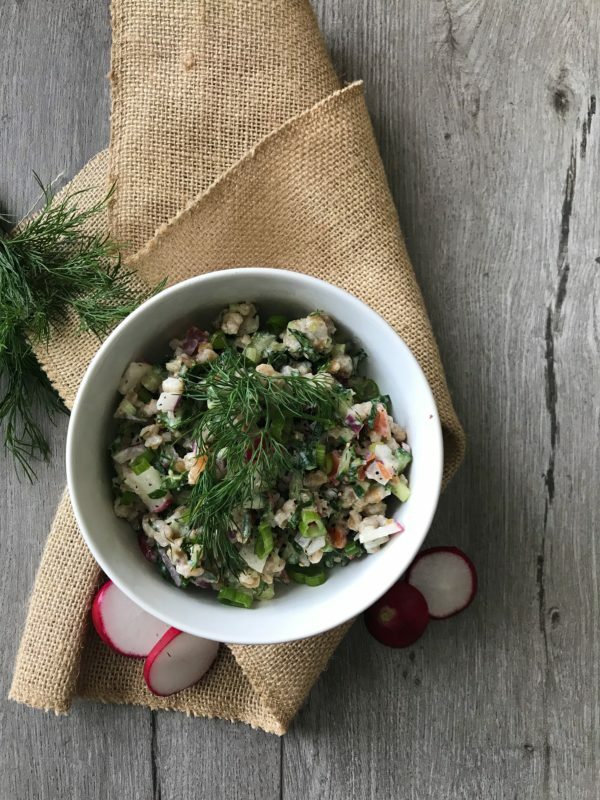 I’m not just bringing you any ole’ salad, though, I’m bringing you a grain salad, scattered with a few of my absolute favorite bright, colorful, summery ingredients. The name “farro” refers to three different types of ancient wheat: einkorn, emmer, and spelt. However, emmer is known as the “true farro” and will be the variety most often found in stores, coming soon to dinner tables near you. It is an ancient grain dating back about 20,000 years ago when it was first domesticated near the Fertile Crescent. I personally welcome this grandpa grain with open arms, as a 1/4 cup dry serving contains 170 calories, 34 grams of carbohydrate, 6 grams of protein, and 5 grams of dietary fiber–hello, regularity! Farro and other ancient grains (amaranth, quinoa, buckwheat, Kamut, teff + more!) are higher in protein and soluble fiber than standard wheat used to make bread and other baked goods1. Since farro is a type of wheat, however, it is not considered a gluten free grain and is thus not suitable for those with Celiac disease. Nonetheless, it is characterized by its nutty flavor and chewy texture, and is a good source of magnesium needed for bone and immune health, regular nerve + muscle function, and regulation of the heartbeat. Farro is also a great source of zinc, which is important for immune health, wound healing, and carbohydrate digestion. Lastly, farro contains vitamin B3 (niacin), which (along with other B vitamins) helps the body to convert food into energy2. All that, plus the fact that it’s delicious? That’s enough to make me say bone apple teeth!! Farro: An Ancient Wheat for Modern Meals. Food & Nutrition Magazine. https://foodandnutrition.org/january-february-2017/farro-ancient-wheat-modern-meals/. Published May 24, 2017. Accessed June 13, 2018. Brown MJ. 5 Benefits of Farro, A Healthy and Nutritious Ancient Grain. Healthline. https://www.healthline.com/nutrition/farro-benefits. Accessed June 13, 2018. Place farro and water (or vegetable stock) in a medium-sized pot, cover with lid, and set over medium-high heat. Bring the pot to a rolling boil, then reduce heat and continue to simmer until the grains have absorbed all of the liquid. This should take approximately 35-40 minutes. While the grains cook, begin washing the kale. Pat the leaves dry with a paper towel and remove the leafy greens from their stems. Once de-stemmed, roughly chop the leaves and add them to a large mixing bowl. Add olive oil and lemon juice and gently massage kale leaves until tender. Chop the remaining vegetables and add to the mixing bowl. Once all veggies are in the bowl, toss gently and season with light salt and pepper. Once the veggies are chopped and tossed, begin making the dressing. In a separate, smaller mixing bowl, combine ingredients, season with salt + pepper to taste, and stir. Set aside for later use. Once the grains have finished cooking, remove the lid and allow them to slowly cool. If you would like to accelerate the cooling process, you can spread them out on a large baking sheet lined with parchment paper. After the grains have cooled, add them to the veggie-filled mixing bowl and toss gently. Add about half of dressing and fold to incorporate. Let sit 15-20 minutes before folding in the remaining dressing. Serve chilled and garnish with fresh dill & freshly ground black pepper, if desired.